If I had to pick a signature item that I always seem to be drawn to, I would choose a striped tee. Stripes are the quintessential Parisian chic. 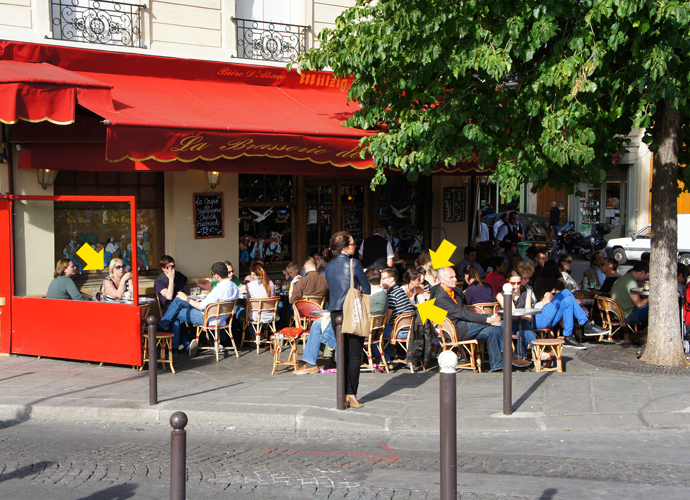 Everywhere I went in Paris, women in striped tees ate outside quaint cafes looking so perfectly French. Horizontal stripes are clouded under the belief that they’re unflattering. I disagree, especially as a top. My Rag & Bone striped t-shirt (similar to the second look above) is one of my favorite garments. It’s a hearty tee, unlike tissue tees which seem to have invaded the market. Sweaters, like the Stella McCartney fourth look, can also be a great way to incorporate stripes. Striped dresses might not be for the faint of heart, but throwing a cardigan over can help minimize the lines. Stripes are a classic look that withstands trends. If ever in doubt, wear your stripes in Paris and you’ll blend in perfectly. It is always such treat everyday to see what you will tempt our fashion senseswith your insights. I enjoy your honesty and common sense with fashion opinions.